FUN - Days 4, 5 AND 6! Obviously I am not very good at posting daily am I?! (ie: I started this post yesterday and never finished it!!!) Well, Sam has been fed and is down for a wee nap, my other boys are gone for the day, I'm on my second cup of coffee and I have maybe 15 minutes before I need to grab a shower! So, here are some more FUN ideas to make up for the past couple of days. #1 - FUN foods - what kinds of foods do you remember enjoying from your childhood? What was a special treat or reserved for special occasions? AND, which foods remind you totally of summer? What other fun foods can you think of (no really...I need some more ideas!!!) Let me know! #2 - Another thing that I think is fun is dollar stores...especially Everything for a Buck or Dollarama where everything really IS just $!! I like to take Grayson there and have a look around. He gets a couple of new toys without breaking the bank, and I usually find a few trinkets myself! Why not take $1 or $5 or $10 (whatever you can "blow") and take a trip to your local dollar store. 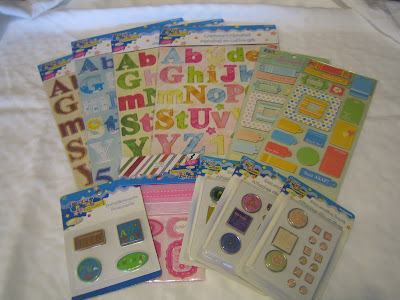 I bought all these scrapbooking embellishments for just $10! #3 - This whole site is full of FUN ideas for you and your kids! Lucky for me, Grayson has still been going to his dayhome since Sam was born, but today is his last day since Mel (our fabulous dayhome provider) is going on holidays, so Mr. G. will be home with me for a couple of weeks. Now since my back is still not 100% and Sam is a greedy little feeder (sometimes every 1.5 hours during the day!) I thought I should have a lot of little activities ready to go to keep G. busy. I got a tonne of good ones from this "Let's Explore" site and am looking forward to trying our quite a few over the next two weeks. So that catches me up on posting my FUN ideas! Now I have to catch up on some FUN scrapbooking projects using one of my favorite tools -punches! I am working on a layout to be displayed (I think I will use CM Everyday Display instead of a shadow box) and one where you "create" your background paper by using up your scraps with your punches! Cool! Will post as I finish up. I'll leave off today with a few new photos that I love...my good friend and gifted photographer Tracy McLeod came to photograph Sammy as a newborn and do some family shots. They are all precious and I can't wait to scrap them! Here are just a couple of my faves! Have a great Friday and Happy Scrapping! Your family photo is so precious! 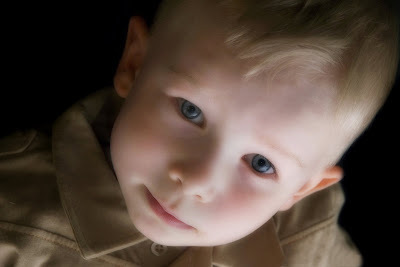 What a beautiful little boy your older son is and the baby is darling. I enjoyed peeking into what was going on at your house a lot. Try to get some rest new Mommy! What a beautiful family! Thanks so much for sharing that fun link! I'll have to explore and play with my son :) FUN foods- we love snowcones here in Texas. YUMMMMM on a hot summer's day.